Only one game is on the schedule for Monday, as the Cats travel to Macon, GA to meet the Bears. The Cats will play three road games this week, in addition to Mercer, Western travels to Samford on Thursday and Chattanooga on Saturday. Here's a run down of Saturday's games including Furman's upset of UNCG and Western's upset of Wofford. The Samford University basketball team overcame a 13-point first-half deficit on Saturday to charge back for a critical 69-67 road victory against the VMI Keydets in a Southern Conference matchup held at Cameron Hall. Samford (14-8, 5-4 SoCon) trailed VMI (5-15, 2-7 SoCon), 33-28, at the half, but used a 51.5-percent shooting performance from the field in the second frame to outscore the Keydets, 41-34. With their win, the Bulldogs improved to 8-4 on the road this season, including an impressive 4-1 mark in SoCon play. Samford's lone road loss in conference play occurred at defending champion Chattanooga, 82-78, last week. Junior Devin Sibley scored 24 points, including 22 in the second half, and Furman converted on all six of its free throw attempts in the final 1:35 to outlast UNCG, 73-67, in Southern Conference men's basketball action on Saturday afternoon at the Greensboro Coliseum. The victory, Furman's fourth consecutive win, lifted the Paladins (14-8, 7-2 SoCon) into first place in the SoCon standings at the midway point of the conference season. UNCG, who came into Saturday in first place, slipped to 16-7 overall and 7-3 in the league. Furman led 60-59 with under six minutes to play when Sibley was fouled while shooting a three-pointer and converted on all three of his free throws. The Knoxville, Tenn., native stripped the ball from Francis Alonso and went coast-to-coast for a layup to extend the lead to 65-59 with 5:23 to play before Kris Acox scored on a pass from John Davis III on the fast break to up the margin to 67-59. With the opportunity to best its arch rival, the ETSU men’s basketball team went to the power game – and it worked. Senior forward Tevin Glass (Norcross, Ga.) posted his first career double-double and fellow senior post Hanner Mosquera-Perea (Istmina, Colombia) matched his career high with 18 points, as the Buccaneers bested longtime rival Chattanooga in an epic Southern Conference showdown 76-71 in front of a sellout crowd of 6,149 fans at Freedom Hall. With the win, the Bucs improved to 17-5 overall, 7-2 in conference play, and are now tied for first with Furman in the SoCon standings after the Paladins win over UNCG earlier in the day. Meanwhile, the Mocs (15-6, 6-3) dropped to fourth and are a half game back of third-place UNCG. Demetre Rivers had 23 points to lead Mercer to its 12th straight victory over The Citadel as the Bears pulled away in the second half for an 82-66 win on Saturday. The Citadel (9-14, 2-8) jumped out to an early lead but Mercer led 33-30 at the break. The Bulldogs' Quayson Williams drilled a 3 to tie at 41 with 15:31 left in the game. Ryan Johnson answered with a jumper and Holland nailed a trey as Mercer pulled away to lead 63-50 following a Strawberry 3-point jumper with 8:01 left. The Western Carolina men's basketball picked up a key Southern Conference victory Saturday night inside the Ramsey Center as the Catamounts outlasted the Terriers of Wofford College, 68-62. Playing in front of an announced crowd of 1,894, the Catamounts controlled the boards and shot the ball well to earn the victory. The Catamounts reached double-figures led by junior point guard Devin Peterson who scored 16 points while dishing out a pair of assists. WCU shot an impressive 53.8 percent from the field in the opening 20 minutes as the Catamounts opened up a 31-28 lead at the break. 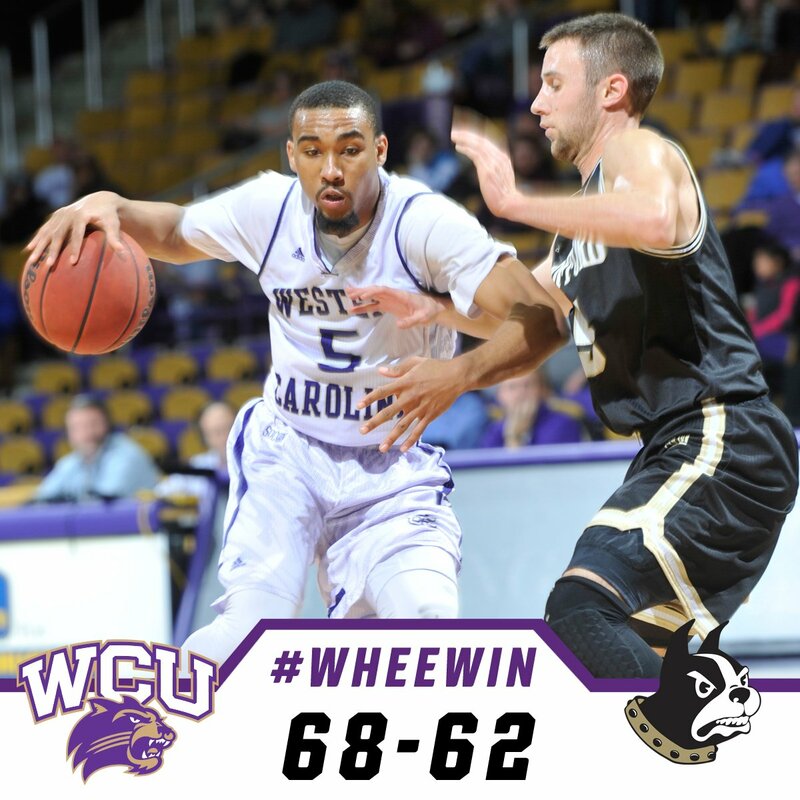 The percentage dipped down to 40.7 percent in the second half but it was enough to give WCU the 68-62 victory. Wofford shot a respectable 47.8 percent from the field in the opening 20 minutes but dropped to 34.5 percent in the second half as they saw the Catamounts pull away for the win. The Terriers were led by sophomore Fletcher Magee who scored a game-high 21 points as he knocked down four 3-pointers. Eric Garcia added 12 points to the cause as well. In January 2012, Wofford head basketball coach Mike Young told the Asheville Citizen-Times Newspaper , “I would rather go to hell, than go to (expletive) Cullowhee." I guess that sentiment still hold true for Young. All ten teams are in action Saturday. Two of the three teams tied for second place face each other in Johnson City, as the Mocs visit the Bucs. QJ Peterson scored 40 points in just 38 minutes, leading the VMI Keydets past the Chattanooga Mocs, 80-64, in SoCon basketball action Wednesday night in Chattanooga, Tenn. The victory was VMI's first-ever win at UTC's McKenzie Arena and first win against the Mocs in any Chattanooga venue since 1979, as the Keydets broke a 20-game road losing streak against UTC. It was the first 11:30 of the second half that turned the game around, as VMI turned a two-point halftime deficit into a 14-point lead with 9:34 to play by outscoring UTC 28-12 over that time period. Devin Sibley scored 25 points to pace four players in double figures as Furman fashioned its second largest margin of victory versus a Southern Conference opponent in school history with an 85-37 triumph over Western Carolina on Wednesday night at Timmons Arena. The win gave Furman its school-record 14th consecutive SoCon home triumph, and improved the Paladins to 13-8 overall and 6-2 in league play. The 48-point margin of victory trails only Furman's 154-67 win over The Citadel on January 8, 1955, for largest margin of victory versus a league opponent. The Paladins shot 54.5% from the field, including 11-for-24 from three-point range, and hit on 14-of-20 trips to the charity stripe to record their third straight win and claim their 18th win in their last 20 regular season home contests. Furman managed a 44-32 edge in rebounding, scored 22 points off 14 Catamount turnovers and totaled 24 transition points. Adam Sledd, Haboubacar Mutombo and Ashley Williams each scored six points to lead Western Carolina (6-15, 1-7 SoCon). The Catamounts shot just 26.8% from the field, connected on only 1-of-12 three-point tries and made just 6-of-19 free throw attempts in the loss. The Wofford men's basketball team ended UNCG's six game winning streak with an emphatic 93-74 victory inside Benjamin Johnson Arena on Wednesday night. With the win, Wofford improves to 9-12 on the season, 4-4 in Southern Conference action, and 8-1 at home. With the loss, UNCG falls to 16-6 overall and 7-2 in conference matchups. Tonight's loss was the first road conference loss of the season for the Spartans. In one of the classic games in the history of ETSU men’s basketball, the Buccaneers battled through two overtimes to ultimately drop Southern Conference foe Samford 96-86 on the road Wednesday night at the Pete Hanna Center. The game – which included 12 ties and 21 lead changes – saw the Bucs make a defensive stop at the end of regulation to force the first overtime, but then look on as Samford’s Christen Cunningham hit a buzzer-beating, game-tying 3-pointer to send the teams to a second extra period. At that point, the Bucs scored 18 points in the final, five-minute OT period – an offensive surge led by 11 points from junior guard Desonta Bradford (Humboldt) and a clutch 3-pointer by senior guard T.J. Cromer (Albany, Ga.) – to take the win. On a night when both Chattanooga and UNCG lost, the Bucs took the opportunity to get back atop the SoCon standings in the loss column, improving to 16-5 overall, 6-2 in league play. Meanwhile, Samford dropped to 13-8, 4-4. Here's the results of Sunday's lone contest. Guards T.J. Cromer (Albany, Ga.), Desonta Bradford (Humboldt) and A.J. Merriweather (Jackson) combined to go 17-of-26 from the field and scored 50 points as ETSU held off a stingy Wofford squad 79-72 Sunday afternoon in Southern Conference men’s basketball action at Freedom Hall. The Bucs – who shot 58 percent from the floor and out-rebounded the Terriers 31-23 for the game – improved to 15-5 overall and 5-2 in SoCon play. Meanwhile, Wofford dropped to 8-12, 3-4. Here's the results of Saturday's four contests. Ria'n Holland drilled 5 of 9 from beyond the arc for 23 points as Mercer bounced back from two straight defeats to dominate Western Carolina 70-50 on Saturday. The Bears hit 11 of 24 from distance, shooting 50 percent from the floor. 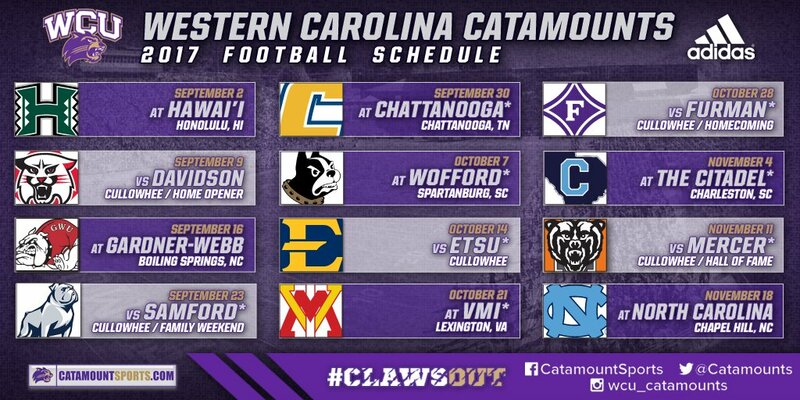 Western Carolina made just 2 of 17 long range attempts, and 16 of 51 (31 percent) field goals. Mercer (9-12, 3-5 Southern Conference), which jumped out to a 43-23 halftime advantage, shot 60 percent from the floor in the opening half while limiting the Catamounts to just 36 percent shooting. The Bears were up 61-48 with 4:04 remaining in the game. Senior Kris Acox netted 18 points and the Paladin bench accounted for 48 points, including 18 from Andrew Brown and 17 from Jordan Lyons, as Furman handled VMI, 89-72, in Southern Conference men's basketball action on Saturday afternoon at Timmons Arena. The win marked Furman's school-record 13th consecutive home victory versus SoCon opposition and improved the Paladins to 12-8 overall and 5-2 in league play. VMI dropped to 4-14 overall and 1-6 in the SoCon. Furman tallied a season-high 25 assists on 33 baskets and managed a 32-26 rebounding edge on the strength of a team-high six boards from Acox. Tre' McLean's 23 points and nine rebounds led the Chattanooga Mocs to an 82-78 triumph over Samford in Southern Conference action Saturday evening. The Mocs jumped out to a large first half lead before holding on in the end. The advantage was as much as 18 in the opening 20 minutes for the home squad. It was 10, 72-62, with 4:37 to go after a four-point play from McLean following a foul and technical on the Bulldogs. The visitors chipped away at the advantage. The UNCG men’s basketball team ran its winning streak to six-straight games Saturday evening as the Spartans completed the season series sweep of The Citadel with an 81-72 victory at the Greensboro Coliseum. The six-game winning streak marks the second time this season that UNCG has won six in a row. This is the first time in program history at the NCAA Division I level that UNCG has tallied two winning streaks of at least six games each in a single season. The Spartans’ 16-5 overall record is the second-best start in program history and surpasses last season’s win total (15-19) in just 21 games this year. UNCG’s 16 wins also ranks seventh most in a single season for the Spartans in the NCAA Division I era. The victory improves the Spartans to 7-1 in Southern Conference play and keeps UNCG alone in first place. The 7-1 start is the Spartans’ best ever start in SoCon play. Only four games are on the schedule today, all are on ESPN3. The big game for the day is Samford at Chattanooga. Western Carolina senior shot putters Scott Peretin and Hailey Cook have been named Southern Conference men’s and women’s field athletes of the week for competition held Jan. 9-15-17. Peretin set a career personal-record after finishing third in the men’s shot put at the ETSU Invitational with a mark of 15.67m on Saturday. His distance of 15.67m was the best mark in the SoCon after the opening weekend of the 2017 indoor season. The Chapel Hill, N.C., native also claimed fourth place in the weight throw and currently ranks second in the conference. Cook won the shot put on the women’s side for the Catamounts at the ETSU Invitational. The Hendersonville, N.C., native achieved a mark of 14.41m to claim first place for the Catamounts. Cook currently ranks first among all SoCon performers through the first weekend of action. 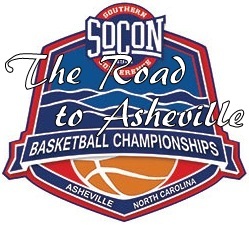 Here's the results of Thursday's four SoCon games. 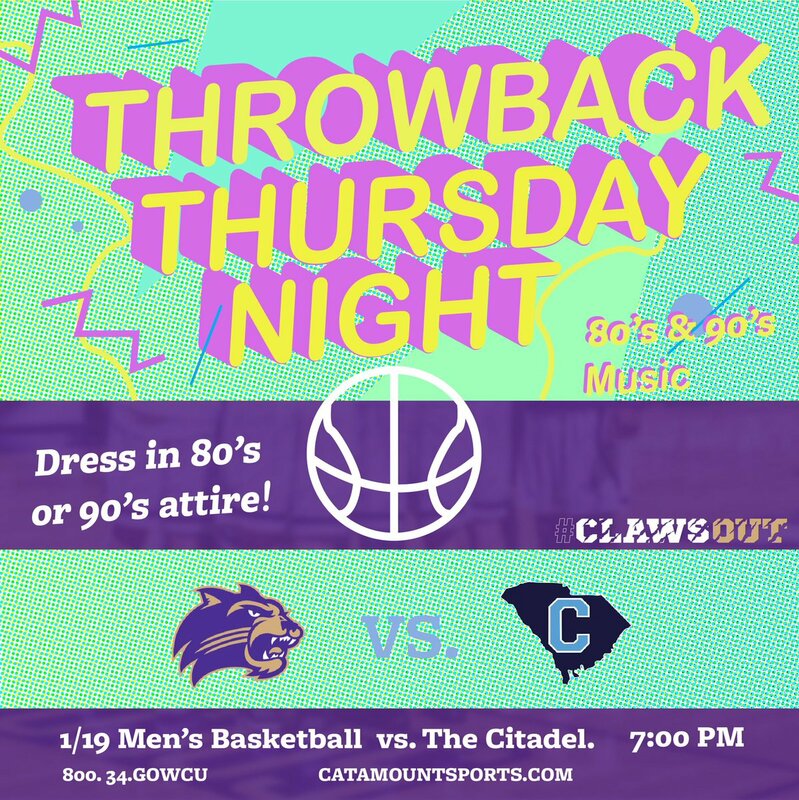 It was 37 years ago that Western Carolina's Ronnie Carr made the first 3-point shot in NCAA Division I history, at the Catamounts' old Reid Gym. Thursday night, The Citadel and Western Carolina staged a tribute of sorts, combining to make 24 of the long-range shots. When the air was finally cleared of basketballs, WCU emerged with a 100-95 victory over The Citadel at the Ramsey Center in Cullowhee, N.C. The Bulldogs made 15 of 38 from 3-point range, including 8 of 12 by freshman Preston Parks, who led The Citadel with 28 points. Western Carolina countered by going 9 of 16, including Elijah Pughsley's 6 of 9 for 28 points. Furman recorded 13 steals and scored 24 points off 20 ETSU turnovers en route to a 75-62 victory over the Buccaneers in Southern Conference men's basketball action on Thursday evening at Timmons Arena. The win marked the Paladins' 12th consecutive home victory against SoCon opposition and improved Furman to 11-8 overall and 4-2 in league play. ETSU dipped to 14-5 overall and 4-2 in the SoCon. Senior Kris Acox led the Paladins with 19 points on 9-of-10 shooting and added a team-best eight rebounds. Davis III connected on 7-of-8 free throw attempts to total 14 points and Sibley added 13 points on 5-of-11 shooting. Daniel Fowler dished out six assists and notched three steals, while Andrew Brown came off of the bench to tally nine points. The Paladins limited ETSU to 37.9% shooting, including just a 3-for-21 effort from three-point range. Furman connected on 47.2% of its shots and made good on 18-of-28 trips to the foul line. Despite being out-rebounded 40-37, Furman held the Bucs to just three second chance points and the Paladins posted a 24-13 edge in points off turnovers. T.J. Cromer led ETSU with 20 points and A.J. Merriweather added 12 points. Desonta Bradford grabbed a game-high 12 rebounds for the Bucs. Cameron Jackson scored a career high 25 points to pace the Wofford Terriers to an 88-70 win over VMI on Thursday night in the Benjamin Johnson Arena. With the win, Wofford improves to 8-11 on the season and 3-3 in conference play, winning back to back conference games for the first time this season, while VMI falls to 4-13 overall and 1-5 in Southern Conference play. The Terriers are 7-1 inside Benjamin Johnson Arena this season and the Keydets remain winless (0-10) in road games. UNCG men’s basketball senior guard Diante Baldwin (Greensboro, N.C./High Point Christian) had a flair for the dramatic Thursday night as Baldwin hit the go-ahead 3-pointer with 4.1 seconds remaining and the Spartans closed the final 2:49 of the game on a 15-5 run to stun Southern Conference foe Mercer 68-66 at the Greensboro Coliseum. The victory ran the Spartans’ winning streak to five-straight games and improved UNCG to 15-5 overall on the season and 6-1 in league play, alone in first place in the SoCon. The Spartans also matched their win total from all of last season with the 15th victory Thursday as UNCG is off to the second-best start in school history and the best since the 1994-95 season. The Purple & Gold Player of the Game for Thursday night's The Citadel contest is sophomore guard Elijah Pughsley. Pughsley came off the bench to lead the Catamounts with a game and career high of 28 points. He hit 8 of 11 field goals (73%), and 6 of 9 from shots from beyond the arc. Purple & Gold congratulates Elijah Pughsley on his selection. A full slate of games was played Saturday, involving all 10 teams. The UNCG men’s basketball team continued its winning ways Saturday afternoon as the Spartans picked up their 14th winning of the season and improved to 5-1 in Southern Conference play with a 91-82 victory over hosting VMI at Cameron Hall. The victory keeps the Spartans on top of the SoCon standings and runs their winning streak to four straight games while moving UNCG to 3-0 on the road this season in league play. The 14-5 start for the Spartans is the best in 21 years, matching the 1995-96 campaign for the second-best start in program history. The Samford University basketball team used a multitude of top-notch offensive performances Saturday to roll past The Citadel Bulldogs, 98-90, in a pivotal Southern Conference contest held at McAlister Fieldhouse. With the win, Samford (13-6, 4-2 SoCon) remained undefeated in away conference games this season and improved to 3-0 when facing league opponents on the road. The Bulldogs also extended their winning streak to three straight games against The Citadel (9-11, 2-5 SoCon). Senior Justin Tuoyo came up with a huge blocked shot with less than 10 seconds to play in the Chattanooga Mocs 70-68 Southern Conference win at Mercer. The win keeps the Mocs in a tie atop the SoCon standings with UNCG at 5-1. Making its first seven shots of the game and shooting 73 percent in the first half, the ETSU men’s basketball team built a 21-point halftime lead and then cruised to a 75-52 win over Southern Conference rival Western Carolina Saturday afternoon inside Freedom Hall. Defensively, the Bucs hounded the Catamounts relentlessly, forcing 27 turnovers and holding WCU to just 36 percent from the floor. With the loss, Western dropped to 5-13, 0-5. Indeed, no Western Carolina player finished in double figures on the night, and the Bucs actually hit more field goals in the first half alone (19) than the Catamounts had in the game (17). Forward Cameron Jackson tallied a career-high 20 points to go with 10 rebounds and Wofford connected on 5-of-7 three-point attempts during a key six-minute stretch in the second half to down Furman, 67-58, on Saturday night at the Benjamin Johnson Arena. The loss dropped the Paladins to 10-8 overall and 3-2 in Southern Conference play, while Wofford improved to 7-11 overall and 2-3 in the league. Wofford shot 45.3% from the field, including 54% in the second half, and managed a 39-31 rebounding edge. Devin Sibley led Furman with 21 points on 9-of-16 shooting and Acox his 7-of-12 shots to finish with 16 points and eight rebounds. Fowler contributed 13 points and a team-high nine boards. The Paladins shot 41.7%, but made just 4-of-20 three-point tries and converted on just 4-of-10 trips to the foul line. Two more games were on the tap for Thursday, No real surprise in the out some of either of these games, as both were toss-ups, who wanted the win more. It took an uncharacteristically good shooting performance and an individual player hitting more threes in a single game than he had all season, but the UNCG Spartans were glad to take the effort in a hard fought 83-79 win over the ETSU men’s basketball team Thursday night at Freedom Hall. 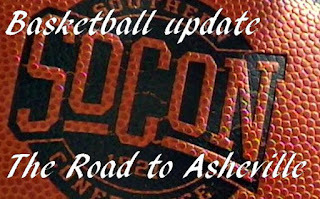 In a matchup of teams atop the Southern Conference standings, the Spartans connected on 13 3-pointers, shot a remarkable 65 percent (13-of-20) from beyond the arc, and got five 3-pointers from post R.J. White – a player who had made three 3-pointers all season – to improve to 13-5 overall and 4-1 in SoCon play. Meanwhile, the Buccaneers – who entered the game in first place – remain tied for first in the loss column, dropping to 13-4 overall and 3-1 in league action. In a game that featured seven ties and 18 lead changes, Keith Smith blocked a potential go-ahead three-pointer as time expired and the VMI Keydets defeated the Western Carolina Catamounts, 79-78, in SoCon basketball action Thursday night at Cameron Hall in Lexington, Va. WCU (5-12, 0-4 SoCon) had cut the margin to one with two Elijah Pughsley free throws with 36 seconds to go, but Trey Chapman missed the front end of a one and one with nine ticks on the clock. Pughsley rebounded and rushed into the front court, but after a pair of passes, was forced into a desperation three-pointer. Smith blocked the attempt easily, setting off the home team's celebration. In the victory, VMI shot 27 of 57 overall (47.4%) and overcame a 20-point deficit (38-18) in the paint. The Keydets were 13 of 34 from downtown (38.2%), including a combined 7 of 11 by Smith and Eleby, and finished 12 of 16 (75%) from the line. WCU shot 29 of 63 overall (46%) and 11 of 15 from the line (73.3%). The Catamounts were 9 of 20 from three-point range overall (45%), including 6 of 12 (50%) in the second half. Two game were scheduled for Wednesday. Johnathan Burroughs-Cook's season-high 20 points led four in double figures in an 83-73 Southern Conference win over The Citadel. Thirteen of the 20 came in the second half. The Mocs held the nation's top scoring team more than 24 points shy of its 97.2 scoring average. It was just the sixth time The Citadel has been limited to less than 75 in a game. Mercer tied a season-high 14 3-pointers and Stephon Jelks notched a double-double as Mercer held on for a 68-65 win at Samford Wednesday night. The Bears trailed 31-30 at the break and the teams battled back-and-forth in the second until Jelks sank a 3-pointer that gave the Bears the lead for good, 61-59, with 5:04 to play. A pair of free throws by Wyatt Walker brought Samford to within one, 66-65, with six seconds to play but Rashad Lewis replied for Mercer with two foul shots of his own and Samford's Christen Cunningham missed a 3-pointer at the buzzer. Only four teams playing in tonight's two scheduled games. 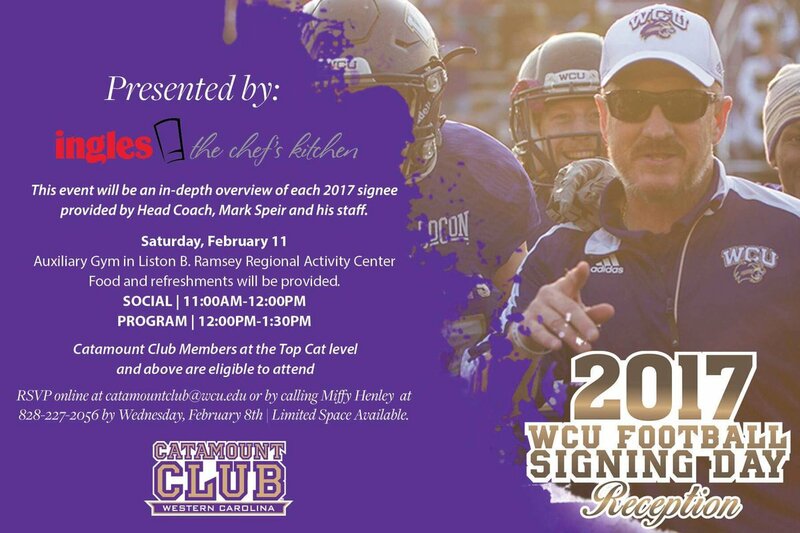 The WCU Football Signing Day Event will be held on Saturday, Feb. 11, due to space limitations, attendance is limited to Catamount Club members at the Top Cat Level and above. There was only one game on Sunday, it was the make-up from Saturday's inclement weather in Birmingham, AL. With approximately four seconds remaining in overtime Sunday and the score deadlocked at 89-89, Samford's Christen Cunningham pulled up for a jumper in the lane and fired the possible game-winning shot. Cunningham's attempt rimmed out, but sophomore center Wyatt Walker grabbed the rebound with just under two seconds left and tipped it in for the decisive basket en route to the Bulldogs' thrilling 91-89 victory over the Wofford Terriers. Walker's game-winning basket helped Samford (12-5, 3-1 Southern Conference) defeat Wofford (6-11, 1-3 SoCon) at home in the Pete Hanna Center for just the second time in school history. The victory also snapped a six-game losing streak to the Terriers.